Our chickens are truly free ranging on pasture. They have unlimited access to fresh grass and woodlands all day, every day. For protection, and to allow for true freedom, we have Livestock Guardian Dogs to defend the chickens against coyotes, foxes, stray dogs, and will even bark at aerial predators signaling the chickens to hide in the tree lines. 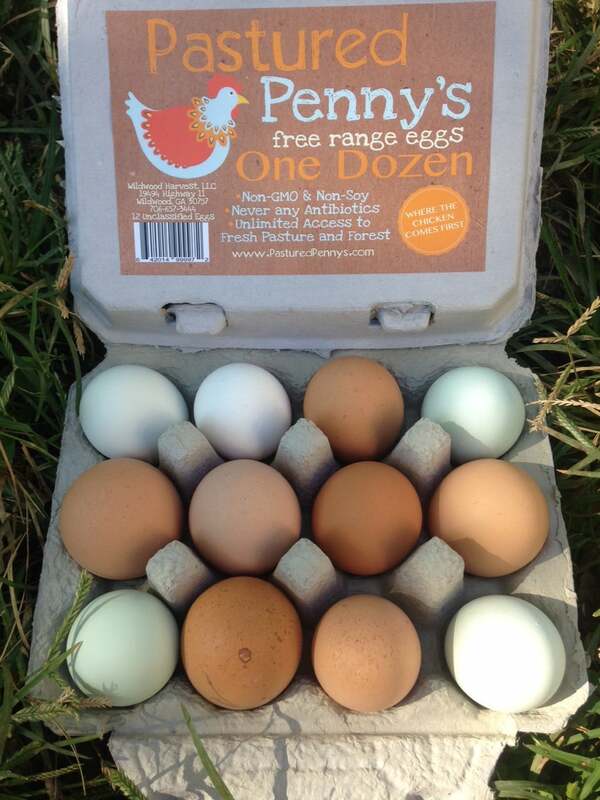 We currently have 900 chickens living on pasture, and they are all named Penny! The Pennys (or is it Pennies?) are able to forage for bugs and eat grass to make for a much more nutritious (and delicious) egg than those without access to pasture. We supplement their diet with organic, non-GMO whole grains and minerals, and they are never given any antibiotics or hormones....ever! Not only are these eggs delicious, they are healthier for you than most eggs. According to the USDA they are higher in Omega-3 fatty acids and protein and lower in cholesterol and fat. They also have 5 times more Vitamin D, because these chickens get to bask in the sun every day! By eating our eggs, you are supporting a local farmer (we are 15 minutes away from Downtown Chattanooga), and stopping the support of commercially produced eggs where chickens are not offered a happy life. We will spare you the details, but we can guarantee that these chickens have a better life where they are spoiled rotten and happily expressing their true chickeness! Our dogs are known in the farm world as Livestock Guardian Dogs, or LGDs. They are crucial to our farm, and because of them, our chickens, pigs, turkeys, etc are allowed to live like real animals should: outside in the fresh air. We have 5 LGDs, all of which have been on our farm since they were pups. Introducing dogs to chickens at an early age is a crucial element to lowering the dogs "prey drive" towards chickens. To foster a bond between the dogs and the chickens when they were puppies, the dogs would sleep in the chicken coops at night. Our dogs are Great Pyrenees and Anatolian Shepherd mixes. One of the beliefs in permaculture is this: the more life in a system, the more life it can support. In our county we have an overpopulation of coyotes and coy dogs (a mix of dog and coyote). While we do have other predators like raccoons, possums, skunks, and hawks, the coyotes and coy dogs are the biggest threat to our animals. So instead of waging war against the coyotes using fatal methods, we simply raised our LGDs. They patrol the farm, establish a territory, and have successfully pushed the coyotes out of the area. By adding MORE life to the system instead of removing life we are able to provide a much more reliable and consistent protection for our animals, and we get the added benefit of having these awesome dogs in our lives! So here they are.....our awesome LGDs!